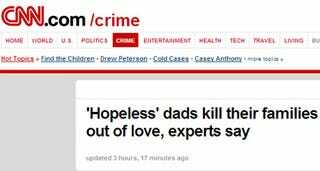 A story about mentally-ill men who kill their families leads to yet another disturbing conclusion: CNN has difficulty distinguishing between domestic violence and love (and between "experts" and "one remaining family member"). The story is about men who commit mass-murders and suicides, spurred by several recent cases in which men killed their families prior to suicides. Not one expert quoted in the piece calls it love, though. Unaccredited researchers said this, though. For decades, psychiatrists have been studying such cases to determine what mental issues trigger this behavior. A person who kills his family could have control issues that lead him to decide the fate of the children, spouse and pets, researchers said. The person with a mental illness views his wife and children as possessions, believing, "I have to keep this. This is mine," Cohen said. "Nobody else is able to take care of them except me. If I can't control this in my life, I'll preserve it in death so that my world doesn't change. It's the psychiatric issues." She adds that pre-murder domestic violence often plays a large role. "People don't get involved, even when they know there's threat in violence because they believe they don't think anything will happen," Cohen said. "It's essential to get to domestic violence safe houses and be much more proactive in understanding there are people who have problems." Louis Schlesinger, forensic psychology professor at John Jay College of Criminal Justice in New York City thinks that it's partially narcissism. "They think they're saving their family and that they will be remembered with sympathy," Schlesinger said. You know, like if CNN memorializes them as having killed "out of love." Dr. Philip Resnick, director of the division of forensic psychiatry at Case Western, says that the men often suffer from mental illness which wreaks havoc on their perceptions of the world. "They become very depressed as the breadwinner," Resnick said. "With their distorted, depressive perceptions, they feel that rather than allow their children to go hungry, they may feel they're doing a favor to take their family with them as they end their own life. ... They're not depriving them of life, they're ending what they see as an intolerable life." Richard James Gelles, dean of the School of Social Policy and Practice at the University of Pennsylvania, agrees that it might be misplaced "altruism" derived from mental illness. "They couldn't leave people behind to be ashamed and humiliated"
You know what none of them say? That men who kill their families do it out of love. Because they don't.